1. My PowerPoint presentation contains a lot of speaker notes. Will the PowerFlashPoint allow my audience to view the notes after conversion? Yes. With our unique player interface, the viewers can read the speaker notes as well as view thumbnails for each slide in the presentation. 2. How well will PowerFlashPoint convert the audio in my PowerPoint presentation? Yes. The PowerFlashPoint will convert recorded narration in PowerPoint as well as embedded.wav and .mp3 audio files. 3. My PowerPoint presentation is set up to play automatically. Will the PowerFlashPoint keep the timing in my PowerPoint presentation? 4. What do viewers need in order to view my PowerFlashPoint converted presentation? 5. Can I remove PowerFlashPoint branding from my converted presentation? Yes, PowerFlashPoint has options to remove the logo from the last slide as well as the optional player. 6. Will I be getting any discount if I plan to purchase mulitple licenses of PowerFlashPoint software? 7. What is the minimum software requirement to run PowerFlashPoint? 8. What is the minimum hardware requirement to run PowerFlashPoint? 9. Why do I get the .NET framework version not found dialog? The PowerFlashPoint software requires the software Microsoft dot NET framework version 2.0 pre-installed on your system to work properly. Therefore you must first install this software before the PowerFlashPoint software is installed. You can download this software from Microsoft's web site. To do so, choose the option 'Download .NET framework version 2.0' in the above dialog and click Next. The PowerFlashPoint setup program will quit and you will be taken to the DigitalOfficePro page from which you can go to the Microsoft's download page to download the .NET framework version 2.0. Once you have downloaded and installed the .NET framework on your machine, you should run the PowerFlahsPoint setup program again. If your system does not have Microsoft Windows Installer 3.1, while installing the .NET framework version 2.0, you may be asked to install the Microsoft Windows Installer 3.1 as well. In this case, you have to download and install the Windows installer 3.1 before proceeding with the installation of Microsoft .NET frame work 2.0. 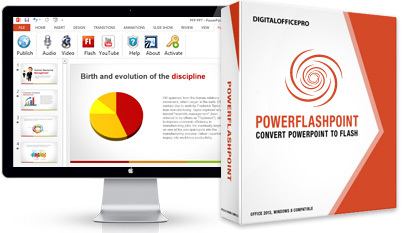 Then install DigitalOfficePro: PowerFlashPoint. 10. Why does the PowerFlashPoint toolbar not show up in PowerPoint? 11. What else should I do to make the toolbar appear in PowerPoint? 12. Why do I get Regasm.exe - Fatal error at the end of the installation? 13. What are the limitations of the Demo version? 1. It converts up to ten slides of you PowerPoint presentation. 2. You cannot create single slide SWF Flash movies. 3. It adds an extra slide with wordings PowerFlashPoint Demo at the end of the Flash movie. 14. What should I do if the conversion process hangs? Close the PowerFlashPoint interface dialog on clicking the Cancel button or the window close button (X) on the top right corner of the interface dialog. Close PowerPoint. Reopen your presentation and try converting again. If the conversion process still hangs, close the PowerFlashPoint interface dialog by hitting the Cancel button and close PowerPoint. Go to the PowerFalshPoint installation folder [eg: D:\Program Files\DigitalOfficePro\PowerFlashPoint] and delete folders Output and Temp. Now try converting again. 15. Why some images does not appear in the SWF? Please apply a border to the images and try converting again. 16. How to make the resultant SWF presentation size smaller? Decrease the Jpeg quality percentage value in the Settings dialog. 17. Does PowerFlashPoint support video embedded into presentation? Yes, it supports embedded Videos..
18. Why doesn't the audio in my presentation play in the published flash file ? Make sure that you have specified audio files which have supported file formats. PowerFlashPoint supports .wav and .mp3 formats. Make sure that both your presentation and embedded audio files are located on your local drive. 19. Does PowerFlashPoint support flash clips embedded into presentation? Yes, it supports embedded flash clips..
20. Does PowerFlashPoint support any language other than English? 21. What audio file formats does PowerFlashPoint support? PowerFlashPoint currently supports audio files in .wav and .mp3 format. 22. When I run the SWF, the flash player gets crashed. What should I do? This problem can be solved by using Flash player version 8.0 or above. Or set the Jpeg quality in the PowerFlashPoint Settings dialog to 100% before doing the conversion. 23. Why the letter by letter, word by word custom animations do not work? At present the PowerFlashPoint does not support letter by letter and word by word custom animations. These features will be supported in PowerFlashPoint's future versions. 24. Why none of the custom animations on the slide do not work? You might have set the custom animation effects for the master slide. At present the PowerFlashPoint does not support master slide custom animations. This feature will be supported in PowerFlashPoint's future versions. 25. Some of the letters in texts are missing why? If you find that certain letters are missing in the converted flash presentation, then please apply another font that is installed on your system (Arial, Times New Roman etc.) and try converting again. If a presentation contains embedded fonts and if that font is not installed on your system, the texts with that fonts may not appear in the converted flash presentation. This limitation will be removed in PowerFlashPoint's future versions. 26. Why do sometimes the letters not get aligned with the rest of the text? This problem happens when a word in the presentation contains multiple font styles like font size, font name, underline, italic, bold etc. To avoid this problem, use the same font style for a word. 27. My PowerPoint presentation contains a lot of speaker notes. Will the PowerFlashPoint allow my audience to view the notes after conversion?